Since the unfortunate amalgamation of the Northern and Southern protectorate which make up the present day geographical expression called Nigeria, Biafrans have worked tirelessly towards the development, progress and unification of Nigeria. Before now, an average Biafran sees any part of Nigeria as his/her home. Biafrans dominated in the areas of science, technology, commerce and arts. Coupled with the unfriendly relationship Biafra had with Britain (as a result of resistance to slavery and deceit by Britain), there was a conspired plan by Britain and their Northern Nigeria puppets to exterminate Biafrans which led to several pogroms and consequently the 1967-1970 genocide. Had Northern and Western Nigeria wanted restructure, over 6 million Biafrans would not have lost their lives in 1967-1970. Had Nigeria wanted equity, the Northern cabals would not have owned over 85% oil wells of Biafra. If meritocracy is esteemed over mediocrity in Nigeria, there would not have been a phrase like 'Quota System'. In fairness, the agreement of 1914 amalgamation that posited for a fresh agreement after 100 years of Nigeria's existence should have been honoured. It was based on these and many more that Nnamdi Kanu, leader of the Indigenous People Of Biafra, IPOB, swore an oath to: (1) either 'restore Biafra' or (2) be lowered into the grave. It was also on this basis that over a thousand Biafrans sacrificed their lives from August 30, 2014 till date -to ensure Biafra is restored. History has proved that Nigeria respects no form of agreement (verbal or written) -from the 1914 amalgamation agreement, the Aburi accord and the 2014 CONFAB; hence, IPOB is not ready to enter into further agreements with Nigeria. If history must repeat itself, this time, it must be in our favour. In recent times, as was agreed at Aburi Ghana, we have seen the perennial and unrepentant despots of Nigeria calling for the restructure of Nigeria. This is in one of her many failed attempts to forestall the rising and passionate agitation for the restoration of Biafra. 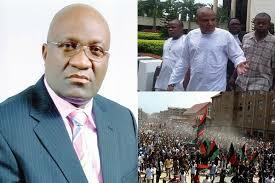 We saw Chief Nnia Nwodo win the Ohanaeze chairmanship election, we have seen him condemn the atrocities committed by the Nigerian government against Biafrans, we have seen him demand for Kanu's release and have also seen him call for the restoration of Biafra; but if the essence of all these is to later turn back and demand for the restructure of Nigeria, then he has failed. If his plans with the Nigerian government is aligning with IPOB to later water down her resolve to restore Biafra, then he has no idea who we (IPOB) are. The inability to enforce conflicting ideas from the elites to the common people was the most difficult task the British colonial masters faced in Biafra; that challenge remains till today. Biafra is a nation where the common rules. No matter how much the ruling class tries to impose an idea over the people, it has never thrived without the consent of the common majority. This is why the restoration of Biafra can never be thwarted by any mortal. Nigeria should understand that no one, group or organization is indispensable in the Biafra restoration project. Their efforts to lure Ohanaeze, IPOB or any other group deemed influential in this restoration project into restructuring Nigeria is dead at arrival. As long as the hawker at Onitsha, the shoe maker at Aba, the hotel steward in Calabar, a fisher man in Ijaw and a farmer in Enugwu demand for Biafra, until then, Biafra restoration is not negotiable. When Biafra Herald published the acceptance speech the man called Nwodo made, I simple posted here "Makes no sense, time will tell". This I did because it was the same type of speech you get from Iwuanyanwu and others. Always hanging in between the line or , in traffic terms, straddling both lanes. I knew this Ohaneze Ndiara (gathering of mad people) promised Nigeria that they would help them get closer to IPOB, penetrate the rank and file, divert them from the true course. I also posted on some other pages. It was ever so clear - they spoke in between their tongues with half of their mouths. But I knew they would always meet a brick wall in IPOB and the MASSOB headed by Uchenna Mmadu. I knew the great gentleman Nnamdi Kanu will not bulge. So we have no fears about their little gimmicks. But we should know that anyone who says "I am Biafran, and the Yoruba man is an Oduduwa, and an Hausa man is Arewa" just forget about that person. He is not one of us. He is a coward, an impostor, one not proud or brave enough to stand with the likes of IPOB and Nnamdi Kanu - period.